Outline: Want to copy your DVDs to portable devices for watching? Want to transfer (Disney, Halloween, Thanksgiving, Christmas, Hollywood, Bollywood, etc.) DVD collection to your hard drive? Just get a free or paid DVD Ripper & Copier! Handbrake and Aimersoft DVD Ripper are the best choice. Here’s how we recommend you go about doing it. There are endless reasons why you might want to rip and convert a movie from a DVD and store it on your computer. You might want to watch a new DVD on your tablet, smartphone, or portable media player, etc. ; you might just want to backup your expensive DVD movie collection; another reason might be that your DVD collection is bulging and you want to free up some room in your house (a terabyte hard drive full of movies could save a huge amount of cubic meters in your house). Anyway…enough rambling on about why you might want to do it, ince none of those gadgets have optical drives, you can’t put any of your DVDs into them. Here’s what we think is the best way to go about ripping DVDs to your computer with the Handbrake and Aimersoft DVD Ripper in some simple steps, so you can play the DVD movies wherever and however you want. Disclaimer: The encrypted DVDs procedures currently occupy something of a legal gray area. You probably won’t face any legal consequences if you simply rip your legally purchased movie collection for your own use, but we’re just going to present the instructions and let you decide for yourself whether to follow the steps. How to Free Rip a unencrypted DVD with Handbrake? To rip a DVD you have to download specialist software, don’t panic though, we’ve found some DVD ripping software that is free and works brilliantly. 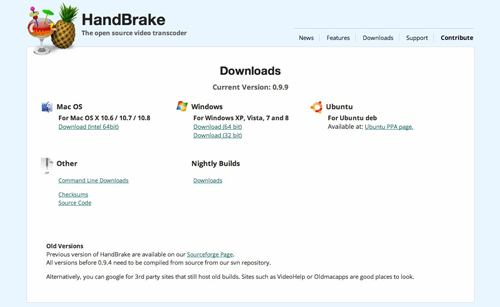 Simply go to http://handbrake.fr/downloads.php and select the link for your operating system, then install the Handbrake software when the download is complete. Step 1.The next thing you need to do is insert the DVD you want to rip into your PCs optical drive and then open the Handbrake program. You then need to click on the Source button located in the top left of the window. Step 2. 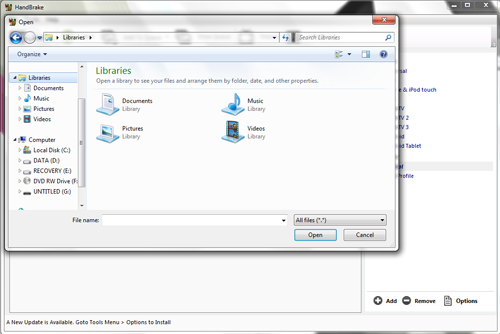 From here you need to locate and select the DVD drive and click open. Step 3. Now that you have select the DVD that you wish to rip, you need to set a destination folder for the ripped content to be saved in. This can be done by clicking on the browse button on the right hand side of the window. Step 4. The last thing of note that needs doing is choosing the file preset for your ripped DVD. 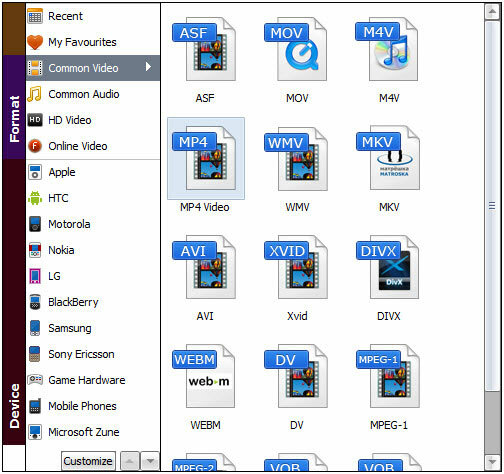 Handbrake comes with a good list of standard presets for you to chose from, so you can rip a DVD to the correct format for popular mobile devices (Apple and Android). How to Rip encrypted DVD with Handbrake Alternative – Aimersoft DVD Ripper? At Times you need HandBrake Alternative software to achieve better Commercial DVD movie conversion, and Aimersoft DVD Ripper is the best recommended HandBrake Alternative. There are plenty of reasons that make Aimersoft DVD Ripper surpass other competitive HandBrake Alternatives, even go beyond HandBrake itself. Aimersoft DVD Ripper is an excellent alternative for HandBrake when it comes to ripping and converting DVD movies. It can convert any DVD movie to any format such as MP4, M4V, MOV, AVI, WMV, MKV, MPG, FLV, etc. If you are a newbie when it comes to converting movies, this alternative of HandBrake for Windows has 175 ready presets that you can choose from. This means that you do not need to have knowledge on the different aspects of video quality such as framerate (FPS) or aspect ratios. 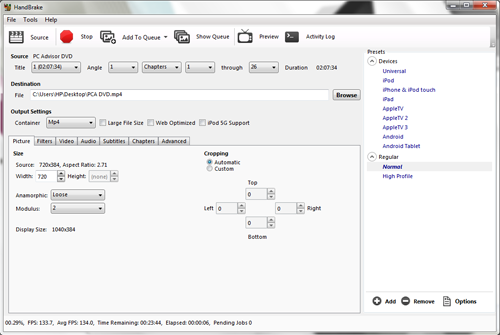 Besides, the built-in editor allows you to trim, crop, adjustment video effect, etc. to get the best overall video effect. This software exceeds all the others in terms of performance, compatibility, and features. It is a ripper, editor, converter, and player all-in-one, thus making it the ideal tool for the job. 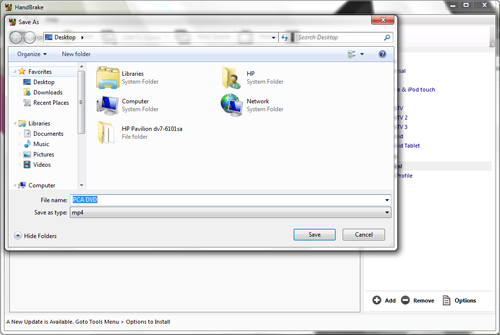 To easily use the DVD Ripper for portable devices, simply download and install the software into your computer. Put the DVD disc in the drive and browse to the target file by clicking on File and then Load DVD. Compatible ones are DVD-9/5, dvdmedia, ISO and IFO. Once the file is successfully loaded, you’ll see the movie title in the user interface. To select the desired output format, click on the icon representing the video’s original format. The new window to pop out will show a long list of options. Click on “Common Video” and from there, a range of output options becomes available. Simply select the one that you prefer. Video presets for the Android, iPad Air 2, iPhone 6, Plex, Surface Hub, Galaxy S7/Edge, Galaxy Note 5, PS4, PSP, Xbox One, Zune, and other popular gadgets will show up there too. Be sure to adjust all settings and select the desired output folder before clicking on the “Start” button on the lower part of the screen. Once you got everything all set up, initiate the conversion and let DVD Ripper do what it should. Then check out the output file in the folder that you assigned right after. If it’s there, then you can begin to enjoy the video in any way you like. P.S. Learn more Handbrake alternatives here. HandBrake Alternative features better stability and compatibility than Handbrake itself. Has been tested time after time by our team, Aimersoft DVD Ripper is proved as 100% safe upon Windows. As for unexpected issues, their prompt technique support will offer you timely assistance (response within 24 hours; for HandBrake however, you need to wait months until they publish next version). ← Can PS4 play MKV, AVI, VOB, M4V, M2TS, H.265, WMV, FLV, Tivo videos? 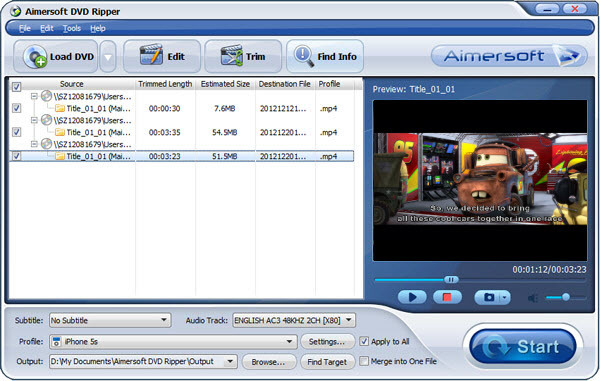 Aimersoft DVD Ripper can help me to rip DVD with different format. and the quality is perfect. I have many old DVDs, quite some are not playable on DVD player. I had tried Handbrake. But it does not work well to backup them. Then someday when I find DVDFab, and decided to give it a try. Surprisingly, DVD Copy can recover from most VOB read errors. Oh, my DVDs come to life again! Thanks for this magic tool! Aimersoft DVD Ripper helps in ripping Commercial DVD-video content in video and audio formats, be compatible with popular devices. There are so many preset profiles for me to choose for my portable device. Moreover, the app adds new preset on regular basis. I want to watch DVD movies on my Computer as High Definition format and this software helps me. With Aimersoft DVD Ripper software, I can also convert and transfer the DVD movies on iPad Mini 3 directly. So confinience. Nice post! I learned a lot. Besides, I also would like to share a useful tool here Wondershare Video Converter Ultimate, which has lots of powerful functions on converting different videos, iTuens movies and DVDs. Maybe it is another choice for users.